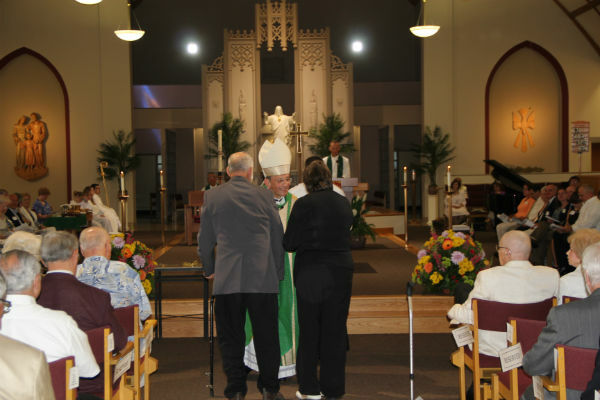 Bishop Lawrence Persico greets a couple celebrating a milestone anniversary. Celebrating a milestone wedding anniversary this year? You and your family are invited to the diocesan celebration for couples marking 25, 50, 60 or more years of marriage in 2018. Register now to join us at one of two Masses: Sunday, Aug. 5 at St. George Parish in Erie (registration deadline July 27) or Sunday, Aug. 19 at Ss. Cosmas and Damian Parish in Punxsutawney (registration deadline Aug. 10). Each couple will be presented with a scroll during Mass. A reception with light refreshments follows each Mass. To register for this cost-free event, visit the website of the Family Life Office at www.eriercd.org/familylifeoffice/anniv.html.